Welcome to one and all from auto racing Mecca, Indianapolis. Here's all the news that I can muster the morning after our shooters party for the Indy 500 media. 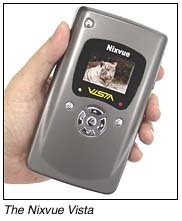 Jobo and Nixvue not only will start shipping their very exciting Vista portable harddrive for digital film downloads, http://www.jobodigital.com/products/vista.htm, but they have how announced another great new product, the IMAGE TANK. The Image Tank will be a smaller, simpler and less expansive download/storage device and sell for only $299.00. Both products should start arriving in mid June. Lexar has now delivered the image recovery system. For the cost of shipping a CF card round trip we will rescue your images, (if possible, not guaranteed), reformat your card, place your images back on the card and send it back to you. We have decided to continue our Lexar 256/12 promotion with a final price, after $30.00 mail-in rebate, of $99.00. Nikon Xs and Hs are still in great supply and don't forget to take advantage of the lens rebatesonly several weeks left. All glass is in stock. Canon is a bit slow in the supply chain, but please be patient and we will do our best to take care of everyone. We have a full load of Fuji Pictrographic supplies at great pricing either by phone or web. I am taking pre-orders for the well sought after Epson 2200, 7600 and 9600 7 ink printers. These babies are unbelievable! Allocations will be short so call soon. Thanks to everyone who stopped by during race month. As always, great to see you and remember, it's supposed to be fun!